Each time you install a program on Windows, it goes with several files and sometimes registry entries. That’s why, when you want to uninstall the program you need to remove these files and entries too, otherwise they are piled up on your hard drive. Windows Add or Remove Programs tool doesn’t allow you to remove all the apps. Windows uninstaller can miss out some leftover data in the Registry and across the system. Complete uninstallation of apps with the default tool may require time and effort. Everything is relative, you may say. We agree and offer you to compare Windows built-in uninstallation feature with the CleanMyPC Multi Uninstaller module to feel the difference. Ready to go? Go to Add or Remove Programs or go to Settings. Open “Apps & features” list. Search for a particular app. That process can be confusing as the feature has a different name in different Windows versions. In Windows XP and Windows 10 it is called Add or Remove Programs. In Windows 7 and Windows 8 you use Programs and Features tool to remove apps. CleanMyPC Multi Uninstaller module gathers all apps in a single place and allows you to remove any apps you need easily. All you have to do is launch CleanMyPC and go to the Multi Uninstaller module, which provides a complete list of installed apps. So, you just click on the app you want to uninstall and then click the Uninstall button. After you confirm the choice, CleanMyPC starts the uninstallation process. Unfortunately, Windows Add or Remove Programs tool can’t uninstall the majority of Windows Store apps while CleanMyPC allows you to remove any installed application including Windows Store apps. The latter are marked with the Windows icon so that you could choose and remove any of them easily. Windows Add or Remove Programs tool may sometimes leave remnants of a program like folders on your C drive, empty registry keys, or application shortcuts, after the uninstallation. That means even if you can’t use the program anymore, it still occupies the space on your computer. Eventually, you don’t even know how many unnecessary files remain after each program uninstallation. So, to keep your computer clean, you have to remove those remnants manually: search through the hard drive using Windows Explorer and then delete the unnecessary files and folders. You can also use the Regedit utility to remove the registry entries missed by the uninstaller. However, you must be aware of what you are looking for. CleanMyPC Multi Uninstaller fights leftovers and removes apps for good. Multi Uninstaller scans your computer and deletes files left by the app after uninstallation. The module has the Safety Database, which lists numerous apps and their related files, so there is no chance that something unnecessary remains on your computer. CleanMyPC also allows you to remove orphaned registry entries so you don’t have to bother deleting them manually. Windows Add or Remove Programs tool offers a good built-in functionality, however it’s pretty basic to cover all your needs. 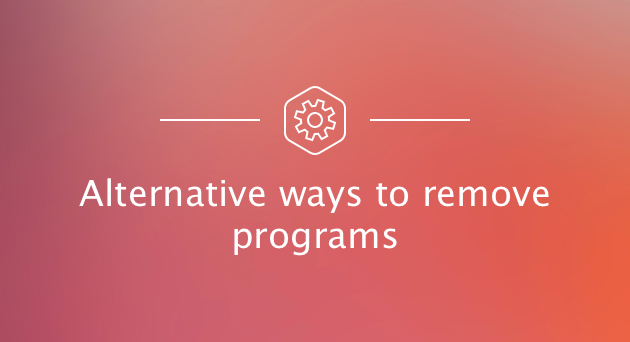 If you want to remove programs safely along with all related files, get rid of leftovers, and free the Registry, CleanMyPC’s Multi Uninstaller module can do it for you. It offers indeed smart uninstallation and requires minimum efforts.